I'm an avid reader of Anjali Ramachandran's Other Valleys - a "short list of creative/technology ideas that are by and large NOT from the US/UK/EU." 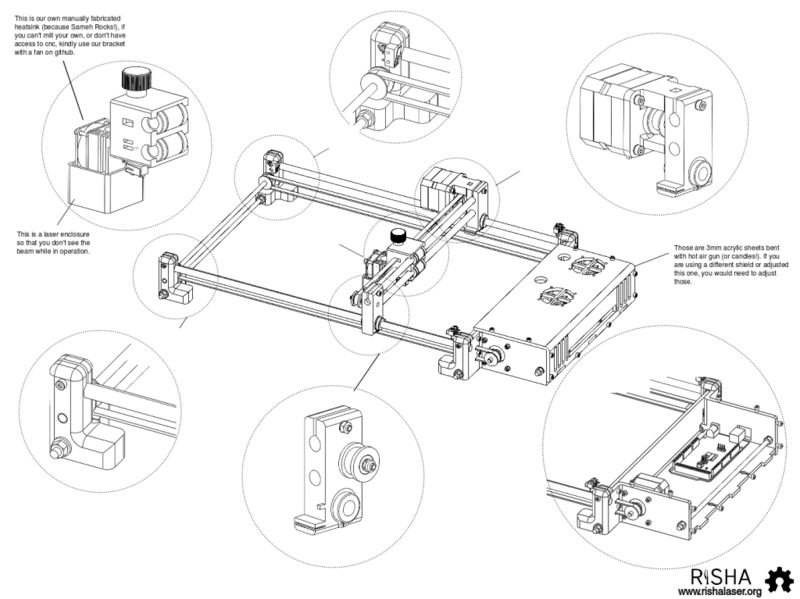 Last November I noticed Risha, a project that both designed and built a laser cutter out of recycled lasers and stepper motors salvaged from old printers. Laser cutters are typically big and expensive - this one seemed extraordinarily accessible and very much in the spirit of Open Engineering. Certainly worth a closer look. I fired off a note to Moushira Elamrawy, one of the project's founders, and she was kind of enough to answer my questions in between "workshops in a village in South Sinai." Tell us about Risha. How’d you get started? What's the project's goal? I have a strong belief that expanding the user base of technology will render magnificent, totally unexpected results both in the way that technology is used and how it is developed. Keeping the closed loop of geek users coupled with trendy technologies, in my opinion, is preventing us from exploring how magical things can evolve with nontraditional maker users. I like the example of the spoon. If you have never seen a spoon before, and you don’t know exactly what it’s for, you are likely to use it in very nontraditional and creative ways, besides or aside from eating. Personally, I wasn’t a maker and I had no clear understanding of how interactive systems work. Now that I design systems, I am more aligned to develop different usability scenarios. Three years ago, I wasn’t 3D printer friendly at all. In fact, this is one reason why I focused on laser. It is a simple 2D technology that requires communicating 2D drawings to the machines in order for it to work. Breaking it down to these simple requirements made me wonder, why do I have to know CAD in order to think in terms of a laser cutter? And why should it take a DXF file to talk to your machine, if it is just about drawing, which is not rocket science. All it really takes is the sketching/drawing skill that many low-tech 2D users already have! That’s one reason I started on Risha. The other is that I’m very eager to get laser cutters out of the lab. I find laser cutters to be more precise and straightforward than 3D printers – they are easier to introduce to newbies. After all, at the end of the day it’s just a cutter. However, it is always one of the heaviest machines in any lab. We can change that. I’m very eager to get laser cutters out of the lab. Then thinking in terms of mobility and introducing laser cutters to new users, I started to think about smart phones, which are widely affordable and accessible by many people in Egypt. So a portable machine that works by phone sounded like the right solution, and since I started, all I could think about was how would low-tech wood crafters use the machine and interact with it? I found MicroSlice on Instructables, and it’s super detailed description made me confident that I could replicate it. At that point, I was just back from Barcelona. I went to icealex, which was a maker space in the making in town, and asked them to give me access to the space in order to replicate MicroSlice, then interface it with mobile. The lab wasn’t ready yet, so they advised that I make a Facebook event to gather a team to work with me while the lab was being prepared. I had zero trust that any team could be formed via a random Facebook event. However, 14 people showed up, and 10 of which continued to be the main team for almost 5 months! It is worth mentioning that flexibility was one way icealex was helpful, and how I personally managed to take the project from a personal hack that I would do on my own, to managing a team that evolved organically from people I’d never met before. Can you tell us a little about your background? What does it have to do with Risha? I was trained as an architect in a very traditional school that didn’t have a fabrication lab or basic CNC machines. I only got introduced to fabrication maybe 3 years after graduation, then recently I moved exclusively to making and interaction. Coming from this background, I always compare how I used to interact with machines, before, when those were inaccessible technologies for me, and after, where now I can design their systems. The amount of creative chances I have missed, personally, as someone who hasn’t been empowered, are huge, and similarly the amount of development that the technology is missing, by focusing on a single specific user case is even bigger. I lived and worked with nomadic communities in the mountains and in the Sahara, and the amount of knowledge of creativity that evolves when this remote user base is empowered with little technologies is incredible. I was doing social and human centered design, and at some point, some people, who have never been to school, started to use CAD to draw their own homes! However, in addition to the language barrier, the engineer/designer interface was complex enough to stop the amazing process of having a nomad designing their own home using CAD and precise measurements, which would have simply revolutionized the entire process of building in remote areas. Imagine. So moving to the making world with this background, my fascination is basically with how can low-tech, skilled, and the remote, interact and make use of the new media and technology trends. Also, portability is always an issue for me, given my passion to work with remote areas, and the fact that labs are more geek/makers oriented, so unless there is a lab in your city, and you know about it, and you have some understanding of what the machines in the lab do, you probably would never use whatever CNC, laser or 3D printing technologies around. So, all this combined got me started! What kinds of projects inspire you? Are there specific projects out there that you wish more people knew about? I am inspired by projects that use new media trends to make a difference. In a simple way, take for instance the eyewriter by Zach Lieberman. There are also projects that use fabrication trends in a very unconventional way to render surreal experiments, like the work of Ball and Nogues, Studio Echelman, Theo Watson, or Usman Haque. I also have a passion for radio and EMF related projects. Are you using CAD? In your opinion, what are its pros and cons? I personally use DraftSight, AutoCAD, OpenSCAD and Rhino. In terms of design field, CAD is great as long as it is used as a way to develop and articulate thinking and detail production in the design process. I repeat “thinking” and “production” because when we work in CAD, we should also think in terms of CAD. It isn’t great if it is used as a “tool” to translate unfinished concepts, and it definitely isn’t great if it is used to generate random forms/entities by manipulating some existing libraries. In terms of product or mechanical design, precision and CAD, that’s a whole different argument. Are you still in a garage? What's the maker community like where you are? I left my garage before moving to Barcelona for my masters. When I rented the garage, I wanted to bridge the gap between low-tech makers, technicians, and the maker scene in the known global sense. I am still interested in that, which is one reason why I started Risha. But starting a space means you need to have some funding, some programs, some community, some commitment, and some energy to do basic logistics. This is all fine, but if none of those things existed in the beginning, it might distract from the creative process itself. I thought starting with small machines that can be taken out of the lab would attract a different, diverse community, and possibly get funding and support to start a mini-machines lab. What is happening with Risha is magical actually, how the project is attracting global collaborators, and people in different places are replicating it. I love when we have an exhibition and someone approaches saying “yes, I built this machine before.” This is just amazing. You mentioned "maker ladies" in Then I became a maker! 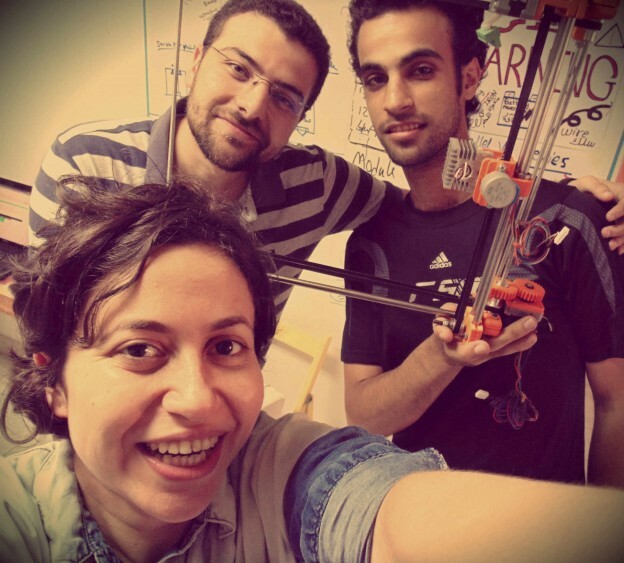 What's it like being a "maker lady" in Egypt? The whole maker scene in Egypt is relatively new. Well, this is in terms of a maker scenes related to Arduino and DIY online tutorials. However, there is a pre-existing group of low-tech technicians who have been solving daily problems with DIY methods for quite some time. Some of those low-tech makers are female, and some of them just aren’t computer friendly enough to document their solutions on instructables. But to answer your question, the scene is new, but we are impactful. For instance, the cofounder of Fablab Egypt, the first lab in Egypt and MENA is Dina El-Zanfaly. There is also Sahar Ahmed, who is bringing low cost solutions with conductive ink, water filters, and carbon sheets - she is just a little genius. I have done several Risha workshops in Egypt and Europe, and in some European countries, I was the only girl in the room among 40 men. So I dare say the situation is fine in Egypt. Who are some of your favorite female makers and why? What are they working on? I love Elizabeth Scott. Her inventions are awesome and her tutorials are clear. I am particularly in love with her AVR RFID tags. I love Hannah Perner-Wilson and Gabriella Levine, for making products with impact. I love Catarina Mota, because she is awesome and because she brings systematization into the process. I love the thousands of female makers everywhere in Egypt who solve daily problems with low-tech solutions within their reach. Those are everyday heroes who are also found in just about every other overpopulated, low resourced country. Kudos to all of them, everywhere. How do you source the lasers? Where do you find recycled lasers? Recycled lasers could come from Blu-ray players. In the very early stages I remember Sherif trying some green lasers and red lasers from CD players, but those weren’t powerful enough. They weren’t effective at all. We usually get our diodes from Amazon or eBay, at least so far. What kind of lasers are you using if not CO2? We use laser diodes within the visible wave length, which is between 350 and 750 nm. Those can reach up to 10W actually, but with an exposed model, in a portable machine we target less power for safety. We use 700mW, but we know others who have replicated Risha in 1W and 2W. This is pretty sufficient for paper, cardboard, fabric, leather, PVC sheets, and it also engraves very nicely on wood and cork. What resources have you found to help cut costs? Used printers! The ultimate treasure, for 8mm rods and sometimes motors as well. We have a second hand market in Alexandria, where we buy used NEMA steppers for as low as 2 EUR each. Don’t envy us too much. You mentioned you've used GrabCAD in the past. How? 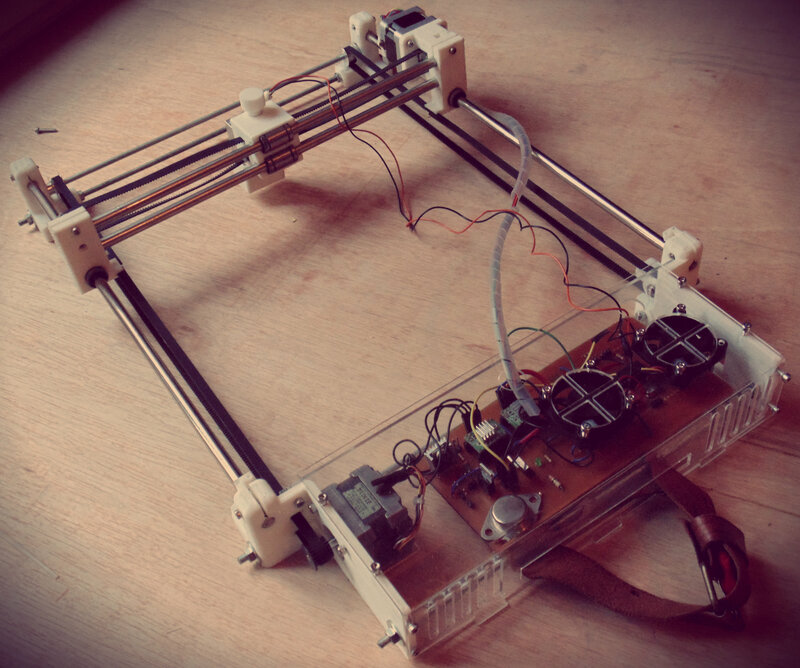 The earlier mechanical team used to share their updates on GrabCAD. It was efficient, given that we weren’t always working together at the same place, and had different availability during the day. It was also great for tracking iterations. Tell us a little more about how Risha uses mobile phones. What types of challenges have you run into? should the app be native or hybrid? if native, who can develop classes for converting JPEG to Gcode, for free? how efficient can we go building on unfinished or simpler solutions? if it is a web app that uses existing libraries written in Python or C, how do we overcome the connectivity problems in remote areas if we are just using Arduino and Bluetooth? There are lots of technical details into that of course, but these are just the basics. There is a general challenge with communicating ideas to developers, using wireframes and prototypes, which are not their favorite. Then there is the fact that not every developer is familiar with Arduino, Bluetooth shields, and G-codes. In our case, we have a basic C# desktop app that illustrates the same functionalities the mobile app will have, and which we use for testing. This app was developed by Sherif Rashwan and Omar Enayet, and is still in beta phase. So far, we realized it is very kid friendly, which wasn’t a particular requirement on our list when we started. Fiore Basile from Fablab Cascina took a different approach towards building a webapp with interface for fab modules. This is still a work in progress. And personally, I am trying to get Risha to work with IOIO while using the app used by Ytai in his drawing machine. There are also plans to have a basic app in HTML5. Anyone willing to jump in and explore, please do. Anyone willing to jump in and explore, please do. Part numbering. 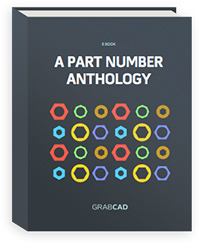 For most engineers, this two-word phrase is all it takes to conjure up especially strong feelings about what it means to be “right”, and what it means to be very, very “wrong.” We've assembled a handful of our part number greatest hits in this eBook anthology. 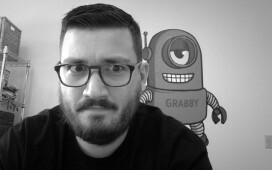 Brian is GrabCAD’s marketing content manager. If you spot a typo on the site, it’s probably his fault.